How History Works assesses the social function of academic knowledge in the humanities, exemplified by history, and offers a critique of the validity of historical knowledge. The book focusses on history's academic, disciplinary ethos to offer a reconception of the discipline of history, arguing that it is an existential liability: if critical analysis reveals the sense that history offers to the world to be illusory, what stops historical scholarship from becoming a disguise for pessimism or nihilism? History is routinely invoked in all kinds of cultural, political, economic, psychological situations to provide a reliable account or justification of what is happening. Moreover, it addresses a world already receptive to comprehensive historical explanations: since everyone has some knowledge of history, everyone can be manipulated by it. This book analyses the relationship between specialized knowledge and everyday experience, taking phenomenology (Husserl) and pragmatism (James) as methodological guides. It is informed by a wide literature sceptical of the sense academic historical expertise produces and of the work history does, represented by thinkers such as Schopenhauer, Nietzsche, Valery, Anders and Cioran. 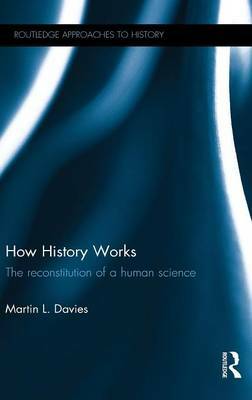 How History Works discusses how history makes sense of the world even if what happens is senseless, arguing that behind the smoke-screen of historical scholarship looms a chaotic world-dynamic indifferent to human existence. It is valuable reading for anyone interested in historiography and historical theory. "Persuasively written and developing a challenging thesis based on the pervasiveness of historicised understanding in giving illusory meaning to our world, this book expresses a thought-experiment that needs to be experienced by all historians willing to reflect on the theoretical nature and social impact of their discipline." "Martin L. Davies's How History Works is the sharpest barrage of arrows directed at history in a long time. Davies is especially severe in his treatment of "public history," and of "normal" history in its "public" (regime-stabilizing) function... I much admire Davies's wit, erudition, insouciant style, and, let it be said, hard work."